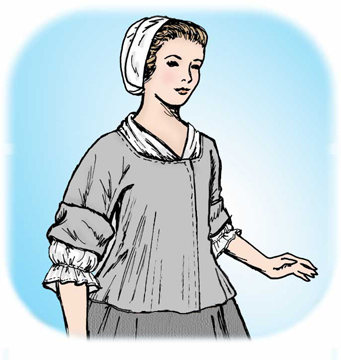 The caraco was a popular form of "undress" or informal clothing in England and America. Reflecting the styles of the day, it was unfussy with clean lines yet semi-fited and feminine. 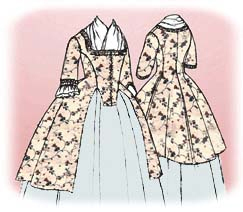 It would be worn over a long petticoat and often have a fichu to fill in the neckline. This style is knee-length with a center-front lacing. 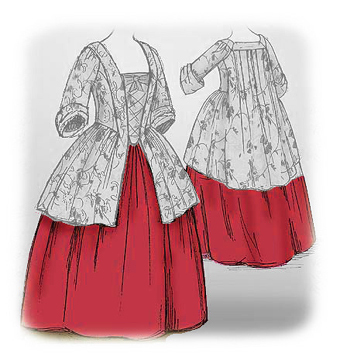 The jacket skirt has pleats on both sides and back. Sleeves are 3/4 length and have a white lingerie ruffle. 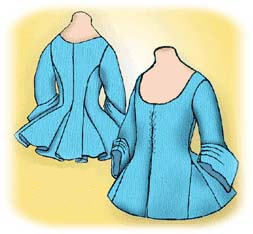 The neckline and cuffs are trimmed with pleated ruching.